Known throughout antiquity as a House Goddess, Hekate is said to protect one’s home and those who live within its sacred walls. 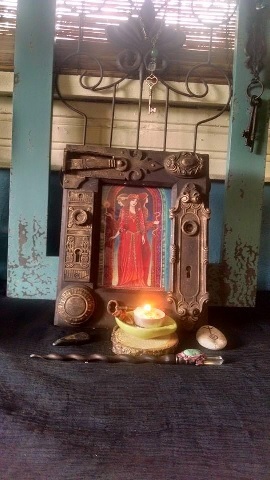 As a goddess of doorways and liminal places, shrines to Hekate are set up near the entrance of homes, businesses, and temples. As Brimo, Hekate is a fierce protector and will guard your home against storms, theft, and malevolent entities (human or spirit). Hekate is such a huge part of my life. So much so that I have written a devotional in honor of our Fair Queen. I wrote this devotional in a month by month essay form for Moon on their blog as part of their Works in Progress series. 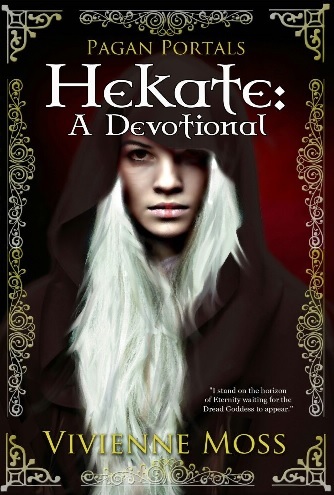 (http://moon-books.net/blogs/moonbooks/) I had a lot of fun with this, and Hekate, my Dark Muse, inspired my devotional with a haunting enchantment that only She can bring. I am very happy to say that Moon is going to publish my book later this year. This will be my first publication and I am nervously excited! Please excuse my shameless self-promotion, I am just truly blessed that Hekate inspired me to write this devotional. I don’t have a publication date as yet, but the devotional is in production mode. I was recently given permission to share the cover for the book. I launched a new Face Book page in honor of both the book and Hekate. (https://www.facebook.com/pages/Hekate-A-Devotional/1439798202995295?ref=hl) Please join me there, or my Face Book page (https://www.facebook.com/pages/Vivienne-Moss-Author/146143182221230?ref=hl), for updates on the devotional and all things Hekate. Cover design by my very talented sister, Elle J. Rossi.